Deliver essential nutrients to your skin with this body scrub special at Le Spa at Pullman Bangkok King Power. Available from July 1 to Sept. 30, the special “Sense of Le Spa” consists of a 30-minute body scrub (choose from Coffee, Green Tea, Jasmine Rice, Thai Herbal) and a 60-minute Le Spa massage, a unique blend of massage oil to help moisturize and soothe your skin. Price is 3,000 net per person. 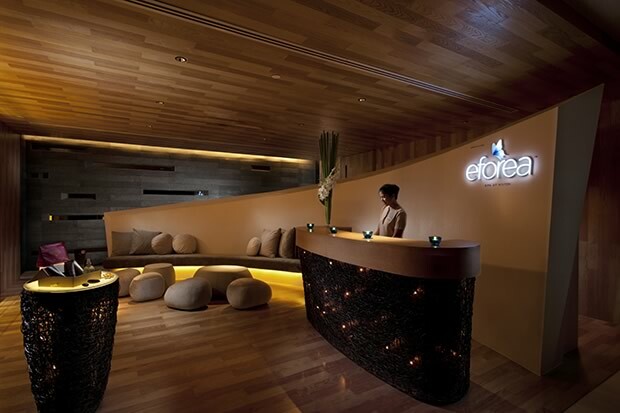 Cense by Spa Cenvaree at Centara Hotel Hat Yai will re-balance your energy with their “Jetlag Relief” treatment. Relaxing warm oils are combined with a pressure point technique, which focuses on the tension areas in your back and shoulders. Your feet will be treated with a green tea ritual, while your eyes rest under a mint-and-green-tea contour. 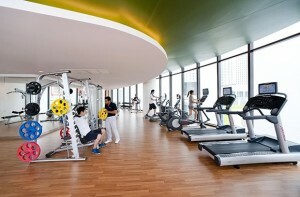 Two hours package at Bt1,700++. The objective of July is clear at InBalance Wellness Center at Novotel Bangkok Platinum: “Burn Your Fat Off.” This promotion introduces membership deals starting from Bt499++/month, up to a yearly membership for a discounted price of Bt15,300++. As a member you will have access to the state-of-the-art exercise equipment, steam rooms, an outdoor swimming pool and a personal coaching service. 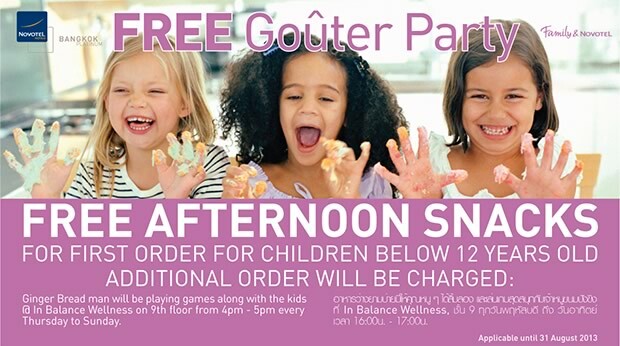 At InBalance in Novotel Bangkok Platinum, kids below 12 years will receive free snacks after ordering their first ones. 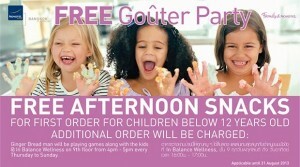 The Goûter Party offer is available from Thursday to Sunday, and menu changes every day: for example on Friday Crepes for Bt60++, on Saturday Tartines for Bt60++, and on Sunday Sugar Glazed Apples for Bt60++. 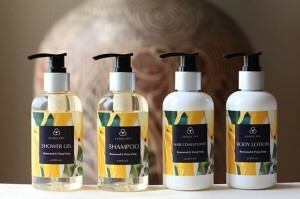 The four elements of traditional Thai medicine: earth, water, air, and fire – are behind the concept of Hansar´s newly launched “4 Elements” spa products. The philosophical elements are regarded as the foundation of the whole body, and Hansar celebrates their power with organic scents, such as Air; Lemongrass and Orange with Sunflower Oil, Rice Bran Oil, Sweet Basil and Thai Bergamot. Buy your favorite as a Massage Oil, Body Lotion, Shampoo, Conditioner and Shower Gel in 200 ml container for Bt370++ – Bt530++. 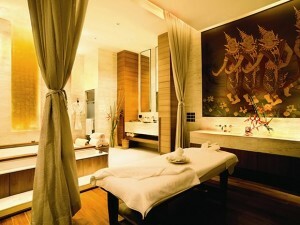 Also package treatments are available at LUXSA Spa at Hansar Bangkok and Hansar Samui. 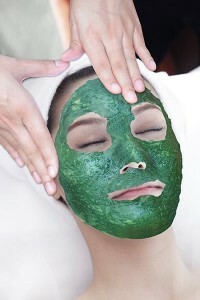 While the raw material grows on their rooftop farm, Novotel Bangkok on Siam Square offers Spirulina facial and body treatments at their Tammachart Day Spa, for a discounted price Bt1,750++. This nutritious vegetarian protein has beneficial antioxidant properties, which make it ideal for face brightening, pore minimization, anti-aging and removal of dull skin cells. The hotel also sells 300 g ready-to-eat portions for Bt600++, to be enjoyed with salads, pasta and smoothies. Oasis Spas are offering a limited-time discount to everyone who books their spa visits online: 30% discount for ‘early birds’ who schedule morning appointments (10 am – 12.30 pm) online for any treatment or package; and 15% when booking an afternoon appointment. It’s easy as 1-2-3:, just go to www.oasisspa.net to find the Oasis Spa near you and choose the date and time of your appointment, Select your spa package or treatments (get immediate confirmation), and make a secure online purchase. This discount is only good for online reservations until Aug. 31. Contact Reservation Center for more information at 02-622-122. Treat yourself to a fantastic program, “Four Elements” spa package provided by professional massage therapists at Neva Spa, Windsor Suites Bangkok Hotel & Convention Center. Relax your entire body and relieve those aches and pains completely in this customized course, designed according to your month birth. The treatment lasts for one hour plus 30 minute extra at only Bt1,699 (normal price Bt3,060). As Special Bonus, enjoy “Aromatic Facial” treatment on the same day at special price of just Bt1,000 (normal price Bt 2,590). Or, make a reservation two hours in advance for both treatments at only Bt2,699 and receive a free extra 30-minute Body Exfoliating treatment (valued at Bt1,400).